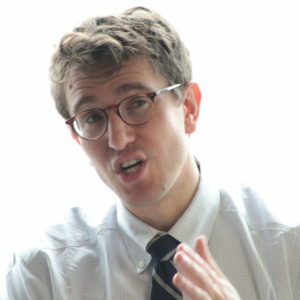 Noah A. Rosenblum studies modern European and American intellectual history, with a focus on the history of legal and political thought. His dissertation, “The Tribe of the Eagle: Presidential Democracy in Thought and Practice, 1927-1952,” explores the emergence of a modern presidency-based regime in the United States in Atlantic perspective. Other research interests include the migration of European intellectuals to the United States in the 1930s, post-Marxist French philosophy, and the history of democratic institutions. Noah pursued concurrent study at the Yale Law School, from which he received his J.D. in May, 2017. In 2017 and 2018, he will serve judicial clerkships with Judge Jenny Rivera of the New York Court of Appeals and Judge Guido Calabresi of the United States Court of Appeals for the Second Circuit. Before beginning graduate school, Noah was a research fellow at Citizens for Responsibility and Ethics in Washington. He has held summer legal positions with the Public Integrity Bureau of the Office of the New York State Attorney General and WilmerHale. In 2015 he was featured on The Colin McEnroe Show on WNPR for his work on public corruption.